Our obstacle course training program is a fun session that we run in Jannali, Sutherland Shire. If Tough Mudder, Spartan and Ninja Warrior are your thing, then you’ll love these classes. You can sign up to these classes online or if you’d like to combine with our other programs then visit the classes page for more info. Series 1 was introduced in 2017 and consists of 5 different levels, each progressively getting more difficult. The first obstacle takes you through the monkey bar, this is made more difficult by adding gymnastics rings at increasingly difficult heights. After that you go the parallel bars where you have to shuffle across them, on the higher levels you have to switch sides multiple times. Next we have some long jumps, increasing in length each level. The fourth challenge is a crawl without dropping a 5kg weight, the distance gets further each level. After that you go back through the course and your time is recorded. Series 2 was introduced in 2018, it follows the same route as series 1 but with new challenges. 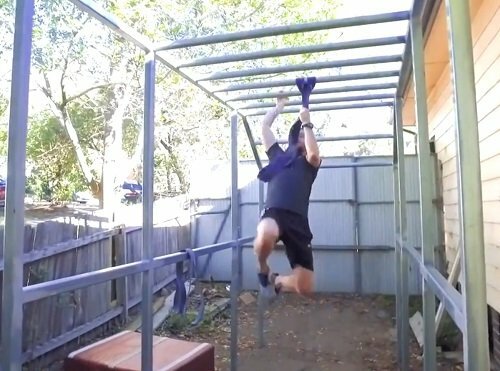 The monkey bars now have bands on them that you must go through, higher levels add extra rings and bands. We now go under the parallel bars, switching sides on higher levels. The long jumps have been replaced with box jumps, one jumping onto, the next over; with increasing heights with each level. Next is a frog jump, going further each level. Back through the course and your time is recorded.